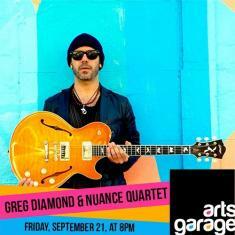 September 21 at 8: Arts Garage presents Greg Diamond and Nuance Quartet. Critically acclaimed guitarist, composer, and bandleader Greg Diamond creates music inspired by Latin American sounds and rhythms which he seamlessly infuses into the context of contemporary jazz - with modal harmonies, compound meters, and various other elements that comprise the vibrant and dynamic musical tapestry of his native city of New York. All About Jazz hails Diamond, who is of mixed Colombian and Jewish origin, as "a rising star in the New York jazz scene.." Latin Jazz Network writes that Diamond is a "composer of great maturity and genius" and featured his sophomore release "Conduit" [Dot Time 2012] as an Editor's Pick for "Best Albums of 2012". Indeed, Diamond has cultivated a distinguishable sound with his own his writing, a crack ensemble, and his use of the electric guitar - an instrument not often associated with this genre. Diamond and his group have performed at numerous premier New York venues such as: The Blue Note, Iridium Jazz Club, Joe's Pub, Smalls Jazz Club, Zinc Bar, and Nublu; not to mention numerous festival presentations, among them: The Madrid International Jazz Festival, Barranquijazz Festival, Jimmy Glass Jazz Festival, Teatro Libre Jazz Festival, Medejazz Festival, Jazz al Parque Festival, and the Nublu Jazz Festival. In 2007 he was a semi-finalist at The Gibson International Jazz Guitar Competition hosted by The Montreux Jazz Festival in Switzerland, where he performed before jazz guitar legend George Benson. He has shared the stage with luminaries such as Seamus Blake, Steve Turre, Hector Martignon, Antonio Hart, John Benitez, Henry Cole, Oscar Stagnaro, Stacy Dillard, Emilio Solla, Michael Philip Mossman, Don Friedman, Gretchen Parlato, Asha Puthli, and many others. Arts Garage is located at 94 NE 2nd Ave in Delray Beach. Tickets are $30-35-40 at artsgarage.org or 561-450-6357. BRING YOUR OWN ... WHATEVER! The theater boasts cabaret-style table seating, where patrons can bring their own food and drinks, including alcohol. Music courtesy of KCC Productions.